For the last few days and I believe for the next few weeks also, I am and will continue to grieve the events of Paris and the slaughtered people of Charlie Hebdo as well as the police officers, hostages, and the death of a poor dog caught in all this insanity. This is therefore a very difficult blog for me to write but one that I find necessary to explain certain things to the rest of the world. Charlie has been a pillar of free speech for years before it was even called Charlie Hebdo (the name derives from the character Charlie Brown in Peanuts and is an inside joke about President Charles De Gaulle; Hebdo means weekly). Most people in France (who are old enough) remember its earlier version called Hara-Kiri. I read many people’s comments on Facebook, Twitter and the numerous articles in the world’s press. For days during the unfolding between the slaughter, the hostage situations and the manhunts, I was glued to my computer screen (and TV set) and witnessed the world’s reaction to all of this (and mourned/cried a lot). It mostly felt like a horror movie in which the ending is really bad for the heroes. I still carry a deep pain in my heart as of this writing. I particularly can’t look at pictures of Cabu without having tears. Some said that Charlie « had gone too far ». What I find fascinating is that these comments mostly come from people outside the country who don’t understand something: French satire. So let me give you some historical context for this. French satire is a tool to express anger, rage, revolt, humor and rejection of the status quo which has been around since the days of Queen Marie Antoinette and to ridicule and fight the then Royalist Feudal system which kept millions of French in dire poverty while a tiny elite of aristocrats were living in Versailles and other castles. They were the 1% of their time, while the rest of the country was its 99% (sounds familiar?). Satire is even older than that as you can find it in the most oppressive kingdoms in history where the only people who could ridicule their rulers were the « bouffons » or court jesters. They could be funny and obscene but they were allowed, weirdly enough, to have their say. No one else could. Satire (particularly French satire) is based on a total rejection of any « ism », whether it is the then « Royalisme » (from royalists) of the kings and queens, or the « ism » of religion, the « ism » of capitalism, the « ism » of all racism, but also ridiculing the ridicule. 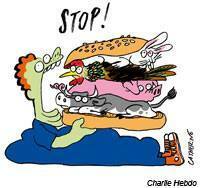 It can explain also why Charlie Hebdo is also the only newspaper in France (satirical or not) which takes strong positions on animal rights (as the cartoon in this blog shows). Yes they can be vulgar, obscene, provocative, even downright unpalatable at times. But they say their truths with their best weapons: their pencils and words. That is the essence of a free society (at least ours) that what you say can’t and should never be policed by violence, whether it’s the state, corporate manipulation or in this case, fanatics. They were not the only ones. Before he died (or was murdered, depending on who you believe), the comedian Coluche (a legend here) was also very much like Charlie Hebdo: vulgar, outrageous, provocative. He even did a mock « gay wedding » with a fellow (gay) comedian at a time when you couldn’t even talk about gay rights, let alone gay weddings. He never said he was gay (he was married) but bluntly said on television 30 years ago that « he had tried it but in the end, that didn’t work out » (and got a big laugh). This shocked a lot of people 30 years ago but now he is a reference impossible to ignore in France’s political and social discourse. Coluche’s outrageous exterior was hiding a heart of gold and he founded « Les Restaurants du Coeur » (Restaurants of the Heart), which 30 years after his death, still feed poor people (of all races and creeds), help them with legal issues, provide services to re-insert them into society, etc… The best satirists and sometimes the most outrageous and provocative people (at least in France) have proven to be also the most generous to others. Cabu was vegetarian and was seen many times protesting animal cruelty. Charb, Wolinsky, Cabu, and Tignous and the other victims present at the newspaper meeting (ironically about racism) that day, as well as Luce Lapin (who was wounded but fortunately is alive) have always took positions for denouncing absurdity while making people laugh at it. But their position on animal rights is not even the point here. France is a secular country. As such, we don’t follow anything but secular laws, not religious laws. In fact, you’re not supposed to even show your religious affiliations in Federal systems like Public Schools (Private & Religious schools are a different matter). Racism is an offense in our laws, mocking religion is not. Charlie is anti-racist and never mocked people based on their race. But they have the right to mock religion. So whether one religious community feels insulted or not, our right to free speech is protected by law. And for the record, nowhere in the Koran does it say that you can’t do a drawing or any representation of the Prophet. This is an idea that has been around since the 15th century only and has become culturally accepted by some Muslims but not all. Religions tend to change in time. There were a time when women had no soul for the Catholic Church. Animals still don’t according to them. I was raised Catholic but would never have criticized the right of Charlie to mock the Catholic religion (and they did). When I moved to the United States, I was ready to follow its laws. There is a reason I never moved to various countries in the world, it’s because I didn’t agree with their laws because they had religion as their state laws. Separation of « Church and State » is a sacred right we won with the French Revolution. It is not debatable even if it may insult various groups. A society where anyone can say anything is what allows vegans, environmental and human rights activists in general to be bold and daring at exposing uncomfortable truths to society. When I was at the Montpellier Republican March (not to confuse the word « republican » as a party as a lot of Americans did, it means March for the Republique), I felt compelled to document visually this day by not just filming the other 100,000 plus people who were there with me but to hear their voices, their feelings. Muslims talked to me. Children talked to me. Even a French-Mexican woman talked to me (I had never met a Mexican living in France, only in Los Angeles). 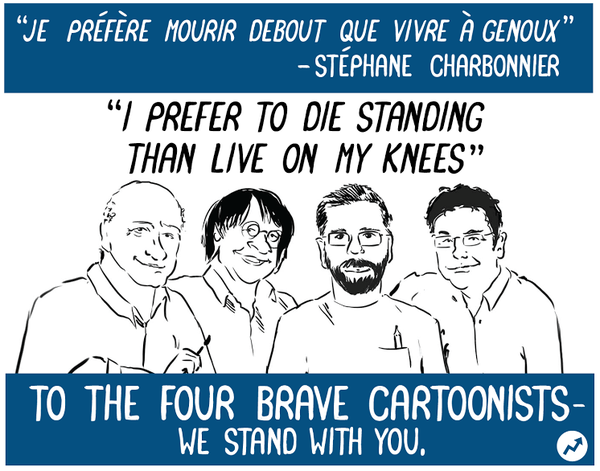 There were people who said that Charlie Hebdo went « too far ». But all of them, Muslims included, said that what these fanatics did had nothing to do with Islam and that, even though they disapproved of caricatures of the Prophet, they also approved of the right of others, in a free society, to ridicule him. It is interesting to know that, besides the threats that fanatics (using religion as an excuse) had made to Charlie, it’s mostly the Catholic Church who sued them most over the years. But that is meaningless, Catholics burned down theaters in France when the movie « The Temptation of Christ » was released. So fanatics can use any religion as an excuse and atheists (like the former Soviet Union’s stalinists, the Nazis, and so on) can use non-religious ideologies with the same zeal to kill as well (and they killed millions of people). And as all the Muslims I met told me, the Prophet would never had agreed with this, no matter how offended he would have been. As activists, we are in a unique time. We live in an extremely bipolar society. It does a 180 in just a matter of hours on every issues. One day, Foix Gras is banned in California, the next a judge changes it back. One day, some guys write a silly cartoon, the next 12 people die for holding pencils from guys who want to police free speech and freedom of expression with violence. This has never been seen before in the West but is common place in repressive regimes in other countries where journalists and human rights activists are commonly put in jail, even killed, for far less than what Charlie did. Let’s never forget that. I defend the rights of Charlie to continue to be funny, obscene (at times) as much as I defend the rights of people like Bill Maher to trash Rush Limbaugh (and vice-versa), or the rights of someone to trash Michael Moore. As Moore explained in his movie « Sicko », he helped a guy maintaining his website, the biggest anti Michael Moore website on the web, with a check so that the guy could pursue his constitutional right « to trash him into the ground » so he could pay the medical bills for his sick wife. I also defend South Park to also be obscene, funny and gross. I can’t always stomach South Park, but I do stomach Maher and like him (even when he trashes religion, which is not something I always find smart or agree with). No one, I hope, will walk into his show with guns to silence him. Bill Maher has a very good response, for instance, for those who hate Rush Limbaugh: « Don’t listen to him ». That’s the point. I personally can’t stomach Rush Limbaugh, therefore I don’t listen to him. But I would never tell him he doesn’t have the right to his opinions, however distasteful, racists, sexists, I find them. I gave my business card to the mother of a child I filmed at the march and she saw on the card that I was a vegan. Her reaction was: « This is not about that right? », she said, offended. I was dealing with lots of emotions and just said « no, it’s not. » She went as far as asking me if I would spread the mini-documentary on « these kinds of Facebook platforms ». So much for free speech and freedom of being a vegan. I wanted to say « well it’s MY freedom of expression and the freedom of animals » but was too emotionally distraught and didn’t want to antagonize on that particular day. Now I regret it. After a few days, It has never been more important to me to defend free speech because when that right is repressed for anyone in society, it is repressed for all. As activists, we already have a hard time spreading our message but if it weren’t for that free speech we cherish and the chance we have to (so far) live in societies which allow that, how far our message would go? Activists should applaud the ideas of free speech, even the offensive ones because without them, there is no freedom at all. Politically correct thinking is often used by politicians and corporations to repress our rights and manipulate us. Satire (even the less palatable to some), has in the past and will continue to point out the truths that others choose to ignore. If we’re to succeed as activists of all kinds, we need to keep our society as free speech zones for all (even the ones we disagree with). Because when this freedom disappears, it disappears for all, including and particularly us. When I saw the outpouring of worldwide support, it didn’t remove the pain but it cushioned it. After all, Cabu’s cartoons were around when I was a kid. He used to draw cartoons on a children show I watched as a kid (proving that he was not just outrageous). The others were French institutions in their own rights. We lost very important people because these people were some of the few who dared resists the status quo, the ridiculous (by being more ridiculous than the ridiculous, if you know what I mean), questioning everything, mocking everyone, regardless of political, religious inclinations and, like all good satirists in history, pointed out truth where others didn’t dare go because of their bias for being politically correct, stay in power and maintain conformity. What this teaches us all is that we have to fight for all to express themselves or none is free to speak. And let’s not forget the others who died or helped in this tragedy. Several policemen/women died in this tragedy, among them a Muslim and a black. Others saved hostages, like a Muslim man working at the kosher grocery store. At the march, I saw Jews and Muslims holding hands in solidarity because they recognized that these killers in no way represented ANY religious beliefs. But they also recognized that this freedom of speech and expression is what gave them their right to practice their faith. It’s what gives us OUR right to be the voice of the voiceless, to be vegans, to be animal, human and environmental rights activists. This is a wakeup call to the world and the world responded by saying #IAmCharlie. But certain forces (you saw them heading the Paris march) will make sure that we try to forget this moment of truth by pushing us back into the darkness of ignorance and conformity. In fact, I know for sure that, if Cabu had been watching the march, he would have drawn a cartoon to mock these political opportunists the following day. They are already taking advantage just like they took advantage of 9/11. Some people here are even starting to talk about « False Flag » attacks. Look up the term. It is up to us all whether this tragedy taught the world a real lesson and to see how far we have grown and how far they will keep us ignorant. Below various links and cartoons as well as two videos: mine from the march in Montpellier (subtitled in English) in which I interviewed as many people as I could to hear the voice of citizens (not the official media) and one on the New York Times website about the Charlie staff in 2006. Cartoon from Bidu: What are cartoonists still able to laugh at? My video (subtitled in English) of the Montpellier (Hérault region of France) march with over 100,000 people and various interviews. Charlie Hebdo is not dead. Guns can’t kill free speech. 3 million copies (compared to the usual 60,000) out because the world demanded it. Article from The Independent. As of Jan 14, 2015: 5 million copies out in various languages, including Arabic (online only). Interesting article of Islam’s hijacking by extremists. Video on the New York Times website (subtitled in English) of the Charlie Hebdo staff in 2006. Update Jan 16, 2015: Great article from Chris Hedges about the real problem with North Africans in France, Message from the dispossessed. Update Jan 16, 2015: Also great interview on Democracy Now! of Tariq Ramadan and Rick McArthur about the bigger picture. Jeremy Scahill on the Hypocrisy of World Leaders at the Paris march. Below: I can’t be manipulated. 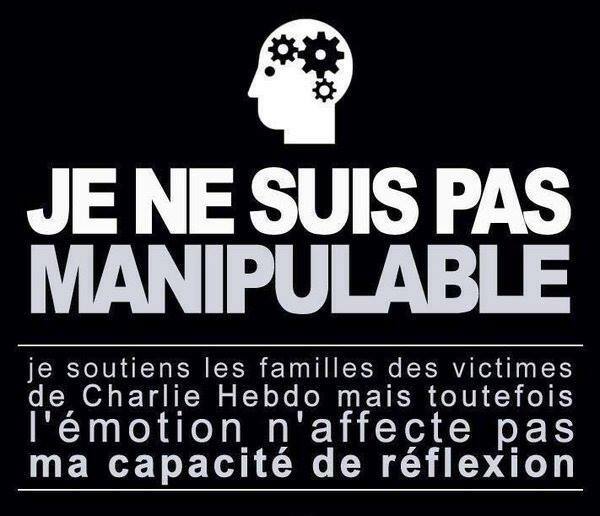 I support the families of Charlie Hebdo but, however, the emotion doesn’t affect my capacity to think. 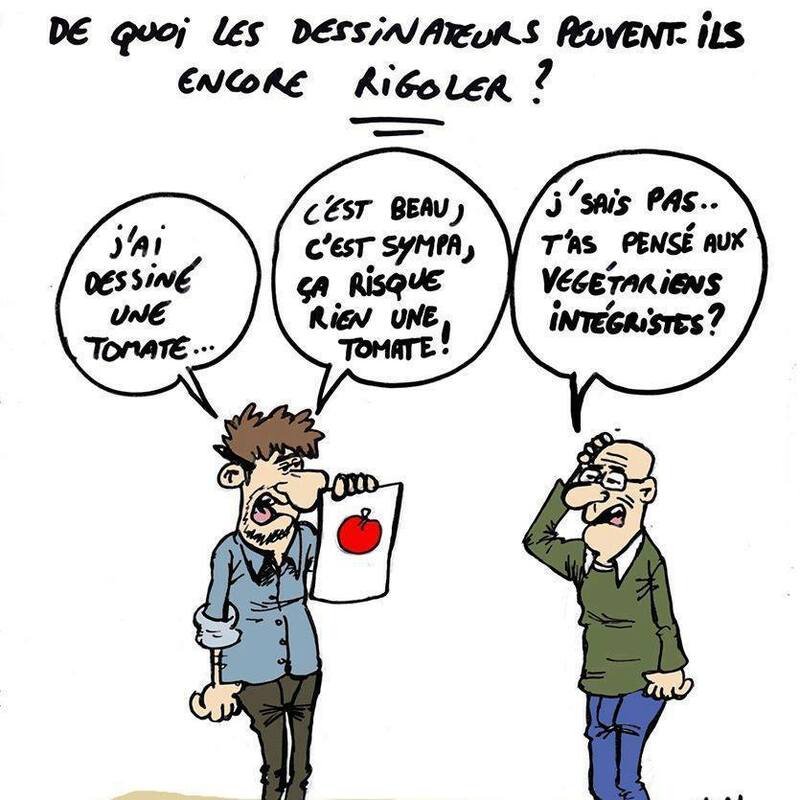 Publié le janvier 14, 2015 par veronique2Publié dans animal rights, Environment, History, Human Rights, Politics, Religion/Spirituality, Veganism, Women's RightsTagué #JeSuisCharlie, Charlie Hebdo, fanatics, Free Press, Free Speech, Freedom of Expression, French Satire, Humor, religion, Republic, Satire. I have seen the disgusting I am not Charlie posts from the ever so politically correct with their usual charges of racism, xenophobia, islamaphobia etc. The gender apartheid, institutionalized misogyny and torture/murder of homosexuals in Islamic states does not similarly offend them. I would ask vegans to think about Ag Gag laws – the Animal Enterprise Terrorism Act, SLAPP lawsuits designed to silence activists and recognize that there are increasing efforts to silence dissent in the USA from wealthy beef producing, factory farm and fossil fuel opponents who control the lawmakers. WE must defend secular society from religious laws. We must defend free speech for our civil rights to promote change depends on it. Thanks a lot. My thoughts exactly. Excellent read. Thanks for putting this in context. Probably my hardest blog to write to date… Thanks Greg. I am also a vegan and an activist.Thank you for this. Very well said. Veronique, this is excellent and much needed! Thank you, thank you and merci for your perspective. Proud to call you my friend. Oh thank you R. Proud to call you my friend as well.